Old time investors used to say that the best thing to do during lean times was buy raw land and just hang onto it. Can’t burn down. Can’t be stolen. Don’t even need insurance on it. Just hang on and wait for it to increase in value. While that’s a much better idea than playing Wall Street Roulette with stocks, bonds, or mutual funds, here’s a way to generate income while you’re waiting for that land to increase in value – self storage units! 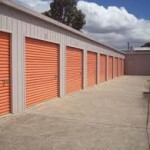 The concept of self-storage units as a property investment has been discussed in more detail over at www.JasonHartman.com. For our purpose today, let’s just hit the highlights. Self-storage units are cheaper to build and maintain than residential housing. Your heating and air conditioning costs will be less. A critical factor is to make sure that the area where your land stands will support a self-storage business. A little research at the city permits department will let you know if any similar developments are underway that might compete with you. You can also assess demand by calling around to self-storage businesses already operating, pose as a potential customer, and try to get an idea of the number of vacancies. If it’s too easy to get exactly what you want, the market may be soft. An even better idea for investing in these turbulent economic times is income properties. Self storage is not a basic human need. A place to sleep at night is.